Seven ancient people are standing in a group, wondering. Some have walking canes or walking frames, some are in wheelchairs. They’re all wondering about something – some are scratching their head or chin, and they have thought bubbles above their heads with question marks. Now, when you think of the 7 ancient wonders, you’ll imagine this wonderful group of ancient people, wondering. The first ancient wonder we’ll memorize is the Great Pyramid of Giza, and we’ll remember that by imagining a grater pyramid of geese, which sounds similar. The ancient people begin to shuffle towards a giant grater (like a cheese grater) and it’s in the shape of a pyramid. Standing on the grater pyramid are a few geese. When you picture this grater pyramid of geese, you’ll recall the Great Pyramid of Giza. Next is the Hanging Gardens of Babylon, which sounds a bit like hanging gardens of baby lotion. One of the geese flies away from the grater pyramid, but crashes into a tower of hanging plants. Growing from the plants are bottles of baby lotion. It’s a hanging garden of baby lotion, and it’s going to make you remember the Hanging Gardens of Babylon. The Statue of Zeus at Olympia is the next ancient wonder so we’ll use ‘statue of zoos at the Olympics’. A bottle of baby lotion falls from the hanging garden and lands on one of a number of statues. The statues are of zoo animals but they’re in the middle of the Olympics. There are runners lined up ready to race, and someone’s high jumping in the background. Picture the zoo statues at the Olympics and you’ll recall the Statue of Zeus at Olympia. The next ancient wonder is the Temple of Artemis at Ephesus. This time we’ll go with temple of art mouse at F&S. One of the zoo statues falls over and hits a mouse on the temple, the side of its head, giving him a large bump. The mouse is an art mouse, he’s dressed like a French artist, with a beret and smock and he’s holding a paint palette and brush. He’s standing in front of the letters F&S which he’s been painting. Focus on that bump on his temple, think of the temple of the art mouse at F&S and that will prompt you to recall the Temple of Artemis at Ephesus. The Mausoleum at Halicarnassus is next, and you’ll remember that by picturing a mouse museum at rally car races. The art mouse has had enough of painting after being hit by the statue, so he decides to go visit a mouse museum. There are small mice on the outside of the museum but I’m not sure what’s inside – maybe cheese. The mouse museum is located right next to a rally car race track and there are rally cars racing straight past. Create a mental picture of the mouse museum at the rally car races and you’ll remember the Mausoleum at Halicarnassus. The next ancient wonder is the Colossus of Rhodes. That sounds a bit like coal oasis of roads. Imagine one of the rally cars goes off the track and crashes into a palm tree at the side of an oasis. Instead of water, the oasis is filled with dark coal, it’s a coal oasis. Stretching out from the oasis are four paved roads, so it’s known as the coal oasis of roads. Picture that scene and you’ll recall the Colossus of Rhodes. The final ancient wonder is the Lighthouse of Alexandria. That’s a tough one, but let’s go with lighthouse of ale hand rear. Out of the middle of the coal oasis, a lighthouse rises up. Painted on the rear of the lighthouse is a hand holding a large frosty glass of ale, which is a type of beer. Clearly picture that lighthouse with an ale in a hand, on its rear, and that will link straight away in your mind to the Lighthouse of Alexandria. And that’s it, you’ve just memorized the 7 Wonders of the Ancient World! Now, when you think of the 7 ancient wonders you’ll picture those 7 ancient people wondering. Some of them shuffle over to the grater pyramid of geese – The Great Pyramid of Giza. One of the geese flies into the hanging garden of baby lotion – The Hanging Gardens of Babylon. Some baby lotion falls onto a zoo statue at the Olympics – The Statue of Zeus at Olympia. A statue falls and hits the temple of an art mouse at F&S – The Temple of Artemis at Ephesus. The mouse goes to a mouse museum at the rally car races – The Mausoleum at Halicarnassus. A rally car crashes into a tree at the coal oasis of roads – The Colossus of Rhodes. And a lighthouse rises out of the oasis with an ale in a hand on its rear – The Lighthouse of Alexandria. The 7 Wonders of the Ancient World, how quick and easy was that? Imagine if you could memorize this easily, when you study, all the time. 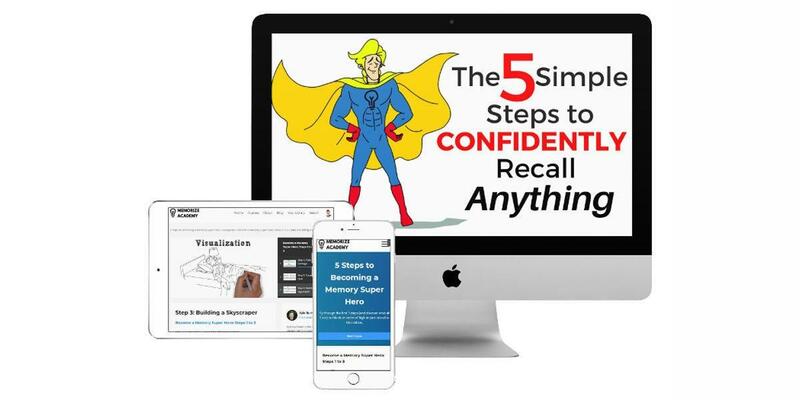 If you’d like to learn how, visit the Memorize Academy website, sign up for your FREE video training , and you’ll learn some foundation best-practice memorization techniques with my one-of-a-kind video training that will transform the way you study and learn. Please give this video a like and share, and please leave a comment below and tell me if you can recall the 7 Wonders of the Ancient World, right now.